A jury found former Klansman Edgar Ray Killen guilty of all three counts of manslaughter Tuesday. PHILADELPHIA, Mississippi (CNN) -- Forty-one years to the day after three civil rights workers were ambushed and killed by a Ku Klux Klan mob, a jury found former Klansman Edgar Ray Killen guilty on three counts of manslaughter Tuesday. The 1964 "Freedom Summer" killings of James Chaney, 21, Andrew Goodman, 20, and Michael Schwerner, 24, helped galvanize the civil rights movement that led to major reforms in access to voting, education and public accommodations. Circuit Court Judge Marcus Gordon set Killen's sentencing for Thursday at 10 a.m. (11 a.m. ET). He faces a prison sentence ranging from one to 20 years per count, said Mississippi Attorney General James Hood. "There's justice for all in Mississippi," Hood said. The jury of nine whites and three blacks reached the decision after several hours of deliberations. The conviction was on a lesser charge; prosecutors had charged Killen with murder. 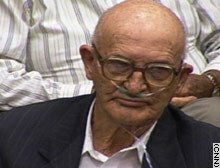 Killen, 80, displayed no emotion as the verdicts were read. But as the wheelchair-bound man was being escorted from the courthouse under heavy guard, he took swipes at reporters' microphones and cameras. One of the reporters was black, as was a cameraman. Chaney's brother, Ben, said that despite the verdicts, "This is not over with. ... But we'll take what we got." From her home in New York's Manhattan, Goodman's mother, Carolyn Goodman, 89, said she had waited a long time for a guilty verdict, but it was "nothing to be happy about." "I'm just overcome. ... But you know I had a feeling it was going to happen," she said. "I just hope he's off the streets," she said of Killen. "I don't want anything more terrible than that. I don't want anything violent. I'm against capital punishment." Schwerner's widow, Rita Bender, said, "I would hope that this case is just the beginning and not the end." She acknowledged the fact that the case likely became a high-profile one because Schwerner and Goodman were white New Yorkers who came to the South the summer of 1964 with hundreds of other volunteers to register black voters. Chaney was a black man from Mississippi. Neshoba County District Attorney Mark Duncan said the verdict means his county will no longer "be known by a Hollywood movie anymore," referring to the 1988 film "Mississippi Burning" based on the killings. "Today we've shown the rest of the world the true character of the people of Neshoba County," Duncan told reporters. In his closing argument Monday, Duncan implored the 12 jurors to "hold the defendant responsible for what he did." "What you do today when you go into that jury room is going to echo throughout the history of Neshoba County from now on," Duncan said. "You can either change the history that Edgar Ray Killen and the Klan wrote for us, or you can confirm it." "Find him guilty of murder," Duncan said. "That's the verdict that the state of Mississippi asks you to return." "Those three boys and their families were robbed of all the things that Edgar Ray Killen has been able to enjoy for the last 41 years. And the cause of it, the main instigator of it was Edgar Ray Killen and no one else," the district attorney said. "He was the man who led these murders. He is the man who set the plan in motion. He is the man who recruited the people to carry out the plan. He is the man who directed those men into what to do." The balding, bespectacled Killen -- a former part-time Baptist preacher -- appeared to be sleeping during much of the closing remarks. Hood, who led the case, said he wished "some of my predecessors would have done their duty" by bringing charges against Killen. Noting that it was "not good politics to bring this case up," he said, politics and time should not get in the way of justice. Hood said testimony showed Killen possessed "venom" at the time of the killings and still does. "That venom is sitting right there. It is seething behind those glasses," he said. "That coward wants to hide behind this thing and put pressure on you." Defense attorney Mitch Moran said "nothing in the record shows Edgar was there" during the ambush and killings. "The '60s was a terrible era in a lot of ways. We do not need to relive them, and we do need to go forward," Moran said. "What I'm asking you to do is to look at this evidence and hold the state to the burden of proving this case beyond a reasonable doubt." On June 21, 1964, Chaney, Goodman and Schwerner were on their way to investigate the burning of a black church when they were briefly taken into custody for speeding. According to testimony, the Klan had burned the church to lure the three men back to Neshoba County. After they were released from the county jail in Philadelphia, a KKK mob tailed their car, forced if off the road, and shot them to death. Their bodies were found 44 days later buried in an earthen dam -- in a trench dug in anticipation of the killings, according to testimony. In a 1967 federal trial, an all-white jury deadlocked 11-1 in favor of convicting Killen. The lone holdout said she could not vote to convict a preacher. Seven other men were convicted of conspiring to violate the civil rights of the victims, namely their right to live. None served more than six years in prison. At the time, no federal murder statutes existed, and the state never brought charges.